Does Game of Thrones Hold Up to Science? The people who created this used a "machine learning algorithm" to figure out who is most likely to die next. They go into a much deeper explanation about their initial data gathering from the books and how they use those factors to predict who's next on the website. 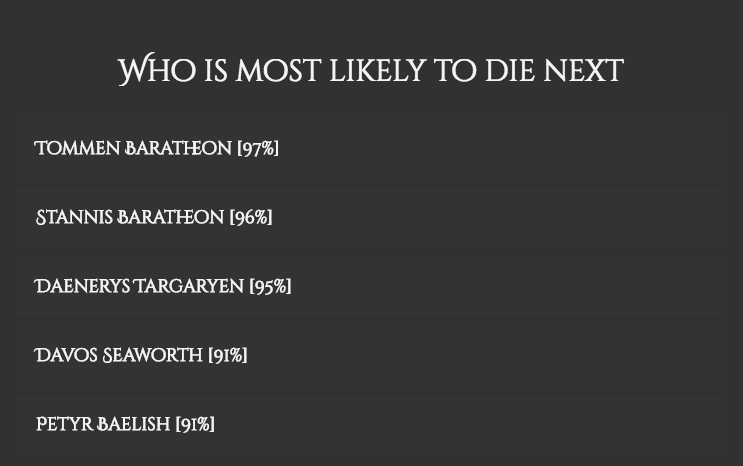 They've also got a ranking system to show you who you can expect to die, although these seem to be based on what the books have revealed so far so we may find out if these predictions come true when season six begins.